I had the pleasure of interviewing Dr. Dominic D’Agostino, a scientist with an interesting and diverse research portfolio that includes collaborations with NASA and the US Navy. Dr. D’Agostino majored in Biology and Nutrition Science at Rutgers University where he developed a fascination with Neuroscience. Dr. D’Agostino then obtained his PhD in Neuroscience and Physiology from Rutgers studying neural control of autonomic regulation, specifically brainstem mechanisms that control cardiovascular/respiratory function. His graduate work within the central nervous system led Dr. D’Agostino to Wright State University for a postdoctoral fellowship where he developed a system to mitigate central nervous system oxygen toxicity in Navy Seal War Fighters. Specifically, D’ Agostino leveraged the neuroprotective character of the ketogenic diet to reduce oxidative stress in the undersea divers. This research exposed D’Agostino to the influence of metabolism, especially within the CNS, and how it may be leveraged to mitigate debilitating disease. Since then, Dr. D’Agostino has emerged as the leading expert on the ketogenic diet. His work has demonstrated the therapeutic potential of the ketogenic diet in the treatment of cancer, its ability to mitigate the physiological impairments associated with extreme environments, and propelled metabolic therapy research forward as we begin to understand just how powerful nutrition can be. The Ketogenic Diet is comprised of primarily fat-rich foods such as fish, red meats, and nuts. What is a Metabolic Therapy? Metabolic therapies utilize macronutrients, vitamins, or minerals obtained through a specified nutritional profile to treat disease. Moreover, these treatments often aim to alter a metabolic abnormality that results from disease. For example, to treat phenylketonuria, a rare metabolic disorder, a plethora of metabolic therapies are employed including supplementing a variety of amino acids and enzyme cofactors. Additionally, and most relevant to this article, treatment of cancers such as glioma can consist of traditional chemotherapy and metabolic intervention including increasing fat consumption while decreasing carbohydrate consumption; this is the basic principle of the ketogenic diet. 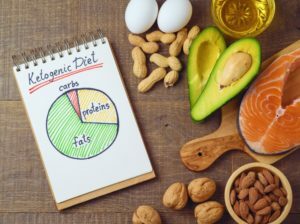 The ketogenic diet is a high fat, low protein, and very low carbohydrate regimen that aims to achieve nutritional ketosis, a metabolic state in which fats are utilized as the primary source of energy through a metabolic process called beta oxidation. Interestingly, beta oxidation is not the cell’s preferred source of energy production. Rather, the cell would prefer to utilize carbohydrates as the primary source of energy through another metabolic process termed glycolysis, only breaking down fats when energy requirements are high and cannot be met through glycolysis alone. Thus, achieving ketosis is quite difficult as it requires a fundamental alteration in the way our bodies break down food to make energy. Both beta oxidation and glycolysis feed into oxidative phosphorylation (our main source of energy production), so put simply, our bodies will utilize whatever is available for energy and in this case, we want it to utilize fats to achieve ketosis. Nutritional ketosis is achieved when blood ketone levels (ketones are byproducts of fat metabolism) exceed 0.5 mmol; this is achieved through a diet comprised of approximately 85% fats. But, how does this contribute to the treatment of diseases such as epilepsy and cancer? First, it is important to realize that carbohydrate restriction in combination with a high fat diet will effectively maintain low blood glucose levels and suppress insulin signaling. Studies suggest that hyperglycemia, high levels of glucose in the blood, increases hyperexcitation of neurons in epilepsy and tumor cell proliferation in cancer. By following a strict ketogenic diet, it is possible to deprive the cancer cells of glucose (their primary source of energy) while normal cells can maintain function by simply using fats as energy. Ketosis has also been shown to be protective against damaging metabolites. Specifically, ketone bodies can mitigate oxidative stress. Oxygen free radicals are highly reactive oxygen atoms that can catalyze unfavorable chemical reactions and are a normal byproducts of aerobic (oxygen-requiring) metabolism. Some research has indicated that metabolites of the ketogenic diet, particularly β-hydroxybutyrate, can effectively reduce oxidative stress by inhibiting highly influential signaling pathways, further strengthening the therapeutic properties of the diet. Lastly, the ketogenic diet is neuroprotective by a plethora of different mechanisms including mitigating oxidative stress, preventing apoptosis, decreasing excitotoxicity by altering glutamate release and increasing autophagy (recycling and degradation processes) via mTOR inhibition. For example, increases in autophagy have propelled ketogenic diet research into realm of neurodegenerative disease treatment where ketone body inhibition of mTOR may allow for the clearance of problematic protein aggregates in diseases such as Alzheimer’s, Parkinson’s and Huntington’s. When the ketogenic diet is used to treat disease, it is a very strict nutritional regimen with a therapeutic purpose. Unfortunately, the diet initially gained traction within the public sphere as a low-carbohydrate weight loss diet. This is demonstrated with fad diets such as the Atkins or South Beach diets which market carbohydrate restriction as the key to weight loss, unfortunately overlooking the basic metabolic principle that an overall restriction of calories, not carbohydrates, will result in weight loss. This unrightfully demonized carbohydrates as the source of fat gain, placed the ketogenic diet in a group with other, non-science based low-carbohydrate diets, and stripped the proven metabolic therapy of its scientific integrity. Yet, thanks to the research and communication of scientists like Dr. D’Agostino, more people have begun to realize the evidence-based benefits of the KD, how it differs from other low-carbohydrate diets, and have incorporated a more sustainable version (compared to the clinical ketogenic diet) into their every day diet. Often, this macronutrient profile is more liberal in protein, but still high in fat and low in carbohydrates. A keto athlete will consume 1.2-2.0 grams of protein per kilogram of lean body mass (optimal for muscle anabolism), no more than 50 grams of carbohydrates, and the rest of his/her calories will come from fats with caloric consumption dependent on the athletes’ physique and performance goals. In addition to reaping some of the anti-inflammatory and neuroprotective benefits of the diet, some research has shown that athletes are better able to maintain lean body mass and overall performance while on a fat-centric diet. From assisting Navy Seals in their underwater missions to treating terminal brain cancer, the ketogenic diet has proven to be beneficial in and outside the clinic. The ketogenic diet currently stands as a first/second-line treatment for various forms of epilepsy, and there is still much research to be performed regarding the its’ role as a metabolic therapy. With time, scientists will begin to uncover the limitless therapeutic targets for this powerful nutritional regimen. Who would have thought a diet could be so powerful? Peer edited by Tamara Vital.